It’s been a very nice break at home, this summer and autumn. But all good things must come to an end, and on Monday I shall have to go out an earn a living once more. So I’m tidying up and winding down. One problem that I have been struggling with for some time is that I have too many books. Not that I keep everything I buy! That stopped decades ago. But I do have rather a lot of books from my youth, which I cannot bear to part with, yet which occupy many shelves in my bookcases. I was thinking of double-banking, putting books less often consulted lower down, etc. But then another thought came to me. 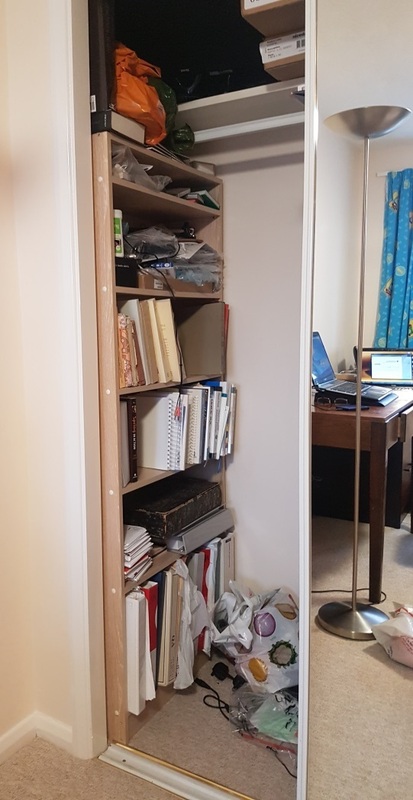 Last night I was looking at my “black library”, of technical books and materials that I keep hidden inside a bedroom cupboard – my study is a converted main bedroom – so that I don’t have to look at them on Sundays. These have thinned out a lot lately, for nobody in IT really reads “computer books” any more. The days when local bookshops would have groaning shelves full of them, on topics from Learning Microsoft Word to Java Enterprise in a Nutshell, are long gone. Everybody googles for it. The technology changes faster than ever, and the books were always less than concise. I idly picked up a couple of standard references, not looked at in some time. Will I need these on my new contract, I wondered? Probably not. I found a download of one on a pirate site, and added the book to the “out” pile. The other I decided I could live without, and put it with the other. The library is contained in some planks from a nearby DIY store, sawn to length at my direction and screwed together on my study floor with the aid of a power drill. Consequently it was designed exactly to contain four shelves of computer manuals. At the bottom it contains still training notes from commercial training courses. All of these date from my days as a permanent employee – who but a corporation could afford those courses? – and so they are all very old. A small space at the top was left for this and that. The whole construction is held to the wall in the middle by a big screw through a small vertical section underneath one of the shelves. It’s not really being used to capacity any more. But the shelves are deep and would take two rows of books, double-banked. So why not redesign it and use it for storing paperbacks? The shelves are only screwed in position, and could be moved and fixed in another position. An extra shelf or two could be inserted. The “white oak” furniture board – which I liked a lot – does not seem to be manufactured any more, so they would not match, but with the cupboard door drawn, who would know? Or it would not cost a huge amount to rebuild it completely. It’s a very tempting idea. I will turn it over in my mind, as I sit in my hotel bedroom this winter. I must start to dispose of some of the other items too. Luckily all the rare books have already gone. But do I really need my paper copy of some of the books on hoaxes that I keep? Surely a PDF would do? On the other hand my old copy of Becker’s Catalogi Bibliothecarum Antiqui will be kept, come what may, for leafing through it is such a pleasure. What shall I do with the piles of old external hard disks that stand atop some of these shelves? Packed with old copies of my hard disk as it then was, they are not exactly used often. Probably they will be best placed in the loft! I have a whole shelf of little C.S. Lewis paperbacks, obtained when I was at university and afterward. These have become so much part of my mental furniture that I probably will never read any of them again. They are perfect candidates for storage in the new black library. But I wish I could get a PDF containing the lot, for those occasions when I need to check a quotation. There ought to be one, surely? Decluttering… is much more hard work than one imagines! I recently saw something of interest, so I’m leaving you a note! There’s a travel show on Amazon Prime (in the US, anyway) called “In Search of Hidden Holy Sites.” It’s a Greek Orthodox-focused travel show, where they show a bunch of stuff on Greek islands. The second episode focuses on Patmos, which is pretty neat and almost too full of pictures. They have a long section on the library of the Monastery of St. John the Theologian, which dates back to medieval/Byzantine times but is now housed in a very nice temperature-controlled facility. (And is open to researchers.) There’s another section about the monastery’s museum, which is also super-impressive, and about all their art (including an icon by the guy who would later become known as El Greco). It all looked like it was in your wheelhouse, so I thought I’d let you know!